Many thanks to Tony for this excellent resource. The title says all that needs to be said about this. Forget the laptop? Use your iPod/iTouch/iPhone to view slideshows on TVs. If you're not sure what iPod model you have, see "Identifying different iPod models." To access slideshow settings, select Photos > Slideshow Settings. Although iPod nano has a color display, it won't output a slideshow to a TV. To display slideshows on the iPod display, set TV Out to Ask or Off. To display slideshows on a television, set TV Out to Ask or On. If you set TV Out to Ask, iPod will give you a choice of display every time you start a slideshow. The first time you use a TV, you'll probably need the Tips for TV viewing and Connecting to a TV sections below. To set how long each slide is displayed, select Next Slide and choose a time. To set the music that plays during slideshows, select Music and choose a playlist. Tip: If you're using iPhoto, you can choose From iPhoto to copy the iPhoto music setting. To set slides to repeat, set Repeat to On. To set slides to display in random order, set Shuffle Photos to On. To set slides to display with wipe transitions, set Transitions to On. Select any photo or album and press Play, or select any full-screen photo and press the select button. Play/Pause will pause the music and slideshow. To skip to the next or last photo, press the Next/Fast-forward or Previous/Rewind button. iPod models that support displaying video on an external video source can do so in two different ways. Using the AV cable connected directly to the top of the iPod or to the line out port on the Universal Dock. Using S-video when the iPod is in the Universal Dock. This method can be used when the iPod is either in or out of the dock. Additionally, you would need a television or other video device that has RCA inputs. Connect the AV cable into the iPod (where the earbuds would normally connect) or to the line out port on the Universal Dock. Connect the red RCA connection into the right audio input of the television. Connect the white RCA connection into the left audio input of the television. Connect the yellow RCA connection into the video input of the television. Tip: The RCA input connectors on a television are usually color coded to match the colors on the AV cable. This method provides slightly better image quality and should be used if possible. This method requires a television or other video device with S video inputs. Additionally, S-video can only be used when the iPod is in the Universal Dock. Place iPod in the Universal Dock. Connect a S-video cable to the S-video out port on the Universal Dock. This connection provides the video signal. Connect the other end of the S-video cable to the S-video input on the television. Connect the AV cable to the line out port on the Universal Dock. This connection provides the audio signal. Some televisions may need to be set to channel 3 or 4 or "video" to receive input. Check with the documentation for your television if you're not sure. Important: You should only use the included cable. Other RCA video cables won't work. Though other cables may look similar, only the Apple iPod AV Cable works with the iPod Headphones and AV port. Compatible iPod models can deliver video out in either NTSC (National Television Standards Committee) or PAL (Phase Alternation Line) video formats. You will have to set the TV Signal setting to either NTSC or PAL when viewing on a television. These are two different broadcast standards, and your TV will only work with one of them. If you don't know which your TV is, simply try both settings to find the one that matches. NTSC is the standard broadcast signal received by televisions in the United States. PAL is the standard broadcast signal received by televisions in many European countries. The main difference between NTSC and PAL is that NTSC delivers 525 lines of resolution at 60 half-frames per second, whereas PAL delivers 625 lines at 50 half-frames per second. You may then need to select the correct video input on your television. If you're not already familiar with the input features of your TV, you'll need to read the manual that came with your TV. If the TV is not set correctly, the slideshow will not appear. The video cable does not carry sound, so you'll need to use the regular audio connections regardless of which display you choose. Run an audio cable from the Line Out port on your Universal Dock to an input on your TV or receiver, for example. As most geeks would know, the Google-developed mobile OS known as Android had its public unveiling last week. While only available on one handset in the US at the moment, its open-source nature and backing from Google mean that it is destined to become a major new mobile platform alongside the existing Palm OS, Windows Mobile, RIM Blackberry, and iPhone OSX. We’re not interested in the competition between these OS’s here, but in what new features Android brings to the use of mobile devices for learning. In this case, what Android brings is an acceleration of the mobile access to cloud computing that iPhone OSX began 18 months ago. Because Google itself has no interest in desktop computers, Android devices currently link in directly with online services rather than syncing with a home computer as every other mobile OS has always done. This means that files, music, video etc are all either accessed online, downloaded directly from the net, or streamed to the handset. What does this mean for education? Well, perhaps its another sign that our many labs stocked with desktop PCs are becoming less and less relevant. Perhaps forward thinking education departments need to start planning a cloud-computing based model for getting out content and services to its students. There’s a few interesting years ahead! To read more on the Android launch (and a whole heap of interesting, though not-education focused comments) read the engadget article HERE. GPS-based spatial learning (geocaching) is a new form of mobile learning for me. I had the chance to experience it in person recently and came away with a new tool in my mLearning kit. Basically, it entails being out and about, using a GPS to find items placed around a physical site. With our guide (Teacher Alan Morely, who has developed the program) dressed as a pirate, we ventured out all over a university campus, deciphering clues to find a treasure. Along the way, we learnt some of the basics of using a GPS such as its digital compass, latitude and longitude readout, and how it only works when moving and out in the open. As far as getting students out of the classroom, the potential of using mobile GPS devices in this way almost limitless. From scenario-based projects like our treasure hunt, to mapping or distance, angles, degrees etc, it has the advantage of being highly practical, while providing a built-in movement/kinesthetic element that many learners need for their learning to go into long term memory. Go HERE to read the full article by Jonathan Nalder at mLearnxyz.net. For those of us who are baseball fanatics, (not Crickett for my EU and Indian readers, although I love that game as well) HotLava Software is bringing mobile learning to the baseball diamond. Fans attending the game have the opportunity to not only see a homerun hit, but learn how friction and drag affect the path of a baseball traveled. Although many learning institutions have attempted to teach science through the use of sports delivered by traditional methods, Kauffman and Hot Lava are taking mLearning inside the stadiums to deliver accessible and captivating on-demand Science, Technology, Engineering and Mathematics (STEM) education via mobile devices. Baseball has always been a mathematical game. I remember from my undergraduate statistics class how much it was involved in the game, now, everyone can take part in expanding their knowledge. Playing computer games in school may sound like the kids rule the classroom. But European researchers have shown that such games can be used to boost learning. What’s more, the special computer games developed by the eMapps.com project could help build communities of creative, networking children across Europe, especially in the new Member States. In the past, the playing of computer games was sometimes thought to be unhelpful, disruptive, and potentially dangerous for a child’s development. Attempts to use them for education were not always successful. But research has shown that people learn best when they are entertained, when lesson plans stimulate both thinking and emotion, when they can creatively work towards complex goals, and when the consequences of actions can be observed. By using mobile devices such as personal digital assistants (PDAs) and portable phones, researchers in the EU-funded project developed interactive tools, primarily games, to achieve learning objectives and deliver the curriculum using information and communication technologies (ICT). Just a note to everyone. Do not download the iTunes 7.7 upgrade. Wait for the 7.8 patch. There is a major problem with 7.7 where it will not recognize your iPod or iPhone when you plug it in, and that will freeze up iTunes. The solution is to back up your entire library, move your library xml, and have iTunes recreate your library. You will lose all your playlists and spend hours trying to build everything back. This problem is multiplied if you have multiple computers, multiple iPods and iPhones, and an AppleTV. Everyone on Apple's support forums are suggesting waiting for the 7.8 patch before you upgrade. As product reviewers, we at eWEEK Labs find frequent occasion to grab screen shots in order to illustrate the software and services we cover. The PrtScn key is our pal, but not every screen we wish to capture rides on a keyboard-toting device. We've resorted at times to photographing device displays, but those pictures tend to turn out poorly. In previous iPhone tests, we hacked the device to install a screen shot application, of which there were a handful in the unofficial software channels. When the App Store came online, we disappointed not to find an Apple-blessed screen grabber, but it turns out that the iPhone's new 2.0 firmware includes a built-in screen capture function. With iTunes 7.7, Apple has given Windows administrators a little more flexibility in how the music and device synchronization manager can be installed. Not only can administrators control which elements of iTunes get deployed, they can also push the software out to desktops via Microsoft's Active Directory Group Policy. Although Apple has made it easier to synchronize certain data (e-mail, calendar and contacts) to the iPhone without requiring a direct connection to an iTunes-enabled PC, administrators will find that iTunes is still necessary is some cases. iTunes will continue to be needed for further iPhone software updates, to unlock iPhones that had an illegal passcode entered too many times or to add homegrown enterprise software to the devices. One of the App Store's most popular pieces of software is Remote, an application that allows iPhone and iPod Touch users to control iTunes or Apple TV from their beloved devices. If you wish to extend your iPhone-based control beyond those applications to your desktop as a whole, you'll be pleased to know that a client for the popular VNC (Virtual Network Computing) server. The client, called Mocha VNC Lite, is freely available from the App Store and is fairly easy to use. Is Your Training in the Red or in the Green? For those folks who know me, they know I am the farthest thing from an 'environmentalist' and you sure don't want to know my views on Global Warming. With that said, however, I am very much an advocate of conservation, both of resources and of budgets. Have you ever thought how much your company spends to educate employees? Sure, you have your budgets for your trainers, for those who supervise trainers, and the extra time employees spend going to training, however, there are many more costs to consider. What about the time spent training your trainers? You will spend for both the trainer's time, as well as the time of the person who conducts the trainer's training? How about facilities? Do you lease spaces for training or conferences? Does your office maintain a training facility? If it does, how much extra have you invested in that facility? Did you have to double your budget of computers? Do you pay for janitorial services? How about electricity? Imagine one training room with thirty PCs left on, as well as projectors, lights, audio equipment, and other support tools always running? Don't forget when your employees are in the training room using those PCs, they probably left their own computers on. How many thousands of dollars do we spend just supplying electricity to training rooms? Do your employees travel to come to training at a central location? What about travel for conferences? Airfare, hotels, meals, not to mention the 'carbon' usage that the greens are always refer? Why hasn't your company embraced mLearning? Instead of sending your employees to training, send the training to your employees. Almost everyone is connected somehow, be it the Internet or mobile phone. mLearning is far beyond just a CBT on a cell phone. mLearning is about delivering the learning content your employees need, when they need it, to the device they have at the time. I doubt mLearning will replace the ubiquitous 'new hire' training, where your employees are welcomed into the team and go through all the necessary evils like HR guidelines. Still, have you ever considered how much you spend each year just to maintain facilities, resources, and personnel dedicated to ongoing, face-to-face training? I would love to hear your stats. How much have you saved moving your learning online? Have you done a cost-benefit analysis that includes all of the items some companies normally overlook in training budgets, such as electricity? How have you gone green? Have you calculated how much carbon your employees use to attend training events? If tomorrow, you faced taxes or fees from the government based on the amount of carbon you use in training, are you prepared to scale back? Do you have a strategy? I would also like to propose a challenge to the eLearning Guild, ASTD, and other training organizations to completely replace one of their on-location conferences with a green, virtual conference. If you have any other ideas or stories about 'going green', please email me at mobilelearn@gmail.com. Sometimes, information is hard to understand just because it’s presented in a manner that just doesn’t quite appeal to the way we like to learn best. While it isn’t always possible to take every class or complete every project in a way that fits into your individual style, there are ways that you can help to ensure that you’re making the most of the material at hand. Here are a few tips to help you start improving your learning experience by helping make it work a little better with your needs, whether you’re a visual, auditory or kinesthetic learner. Those who are visual learners understand concepts and ideas better when they are presented in pictures, text, drawings, graphs, charts or other visual representations. Here are some tips for making your coursework and schooling a little easier if you’re a visual learner. Keeping your stuff together and staying on task can sometimes be a challenge. These tips can give visual learners a leg up on organization. Color code. If you color code classes, assignments or anything else you’ll be able to identify and locate these items just at a glance. It can be helpful if you’ve got a habit of being messy. Make lists. One way to organize your thoughts is to put them on paper or on the computer. Once you’ve created this visual representation it will be easier to see what you need to get done. Keep like materials together. Creating groups can be one way to keep yourself visually organized. If you’ve got books and notebooks for one class, try keeping these together. Diagram how things are related. Whether you’re trying to get research done for classes or just figuring out anything in your day to day life, you can benefit from creating a diagram or mind map to show how elements are interconnected and how you need to proceed. Keep focused in class with these tips. Always take notes. If you have a hard time remembering things that you hear, make sure to write them down. This can give you a visual reference later. Visualize how to spell words. Spelling words in your own language or in another can be hard for visual learners who are just hearing them. Tying spellings, especially difficult ones, to visual cues can make it easier. Relate things through graphs and charts. If your class is filled with facts and figures it can be helpful to lay them out in ways that make more sense to visual learners, like graphs, charts or diagrams. Your information will be more organized and easier for you to understand, helping you in the long run. Use several colors. Some visual learners find that it helps to use different colors of ink to highlight different areas of their notes. Vocab words can be in one color, definitions in another and so on. Sketch. Whether you’re taking a class on architecture or human anatomy it can be helpful to sketch out concepts sometimes. It will help you to better remember and understand how they work later. Look at your professor. Because visual learners are so dependent on seeing things to understand it can help to sit near the front of the class and look at your professor. This can alert you to subtle body language and help you stay more engaged and focused. Copy information off the board or overheads. If your professor is providing you with visual information to use in class, copy things down to your own notebooks, even if you can look it up later. Studying can be a bore sometimes, but you can make the time you spend more effective with these tips. Create a timeline. When dealing with a sequence of events you’re trying to remember or understand it can be useful to lay them out in chronological order on a timeline. This way, you’ll be able to more easily visualize how things changed over time. Make outlines. Whether you’re writing a paper or just condensing your notes to key concepts, creating an outline is a great way to organize information in a way you can see. Study in large blocks. Visual learners are often very good at concentrating for long periods of time. Take advantage of this and get your studying out of the way in big chunks. Diagram anything you can. Diagramming can be a good way for visual learners to understand a variety of topics, from geological processes to sentence structure. Make lists of important topics. Listing out the most important topics from your notes or readings can be a good way to help you remember the key elements and provides a visual reference for later. Watch videos on relevant topics. Videos can be a big help to visual learners when trying to understand coursework. Search the Web for videos that apply to your topic to see if you can find some great visual tools. Take notes on reading material. While understanding reading material is generally second nature to visual learners, taking notes can help improve the amount of information you retain and gives you something to study from later. Use flashcards. Using images or text on flashcards can be a great way to associate concepts or vocabulary words with visual representations. Create separate piles for cards you answer correctly and those you miss. Go through the missed ones until you can get them all right. Highlight, circle and underline. Creating visual cues for yourself as to what parts of your notes or reading are most important can be a a great way get more out of the time you spend working on homework and studying. Look for photos. If there are images of what you’re learning about in class try to find them. This can often be all you need to understand even the most complex of concepts. Implement mind maps. Mind maps can be a great way for visual learners to organize information from a class or to come up with ideas for projects and papers. Use the computer. Much of our interaction with the computer is done in a visual manner, and this can form an ideal learning environment for visual learners. Check the Web for programs and sites you can use to improve your learning experience. Try creating mental images. When you’re struggling to remember things, sometimes creating a mental image for yourself can help, especially when it comes to things that aren’t visual by nature. Find visual representations of audio recordings. If your class relies on historical recordings or other audio materials try finding text versions of the same things. This can be a great way to help you get some visuals and possibly remember more. Keep things quiet. Most visual learners are very easily distracted by noise in the background or other people talking around them when they’re trying to do work or study. Find a quiet place like the library to do your work. Engage your imagination. Visual learners love to use their imaginations and think of new things. Use your imaginative abilities to come up with new ways of seeing topics in class, ideas for papers or great ways to visually represent an idea. Most of my mLearning friends are undoubtedly aware, but there is a great tool for developing learning content while mobile. Google Docs are available on mobile browsers. I have found in my adventure drafting my first book on mLearning, that inspiration can happen anywhere, at anytime. I caught myself recently in a restaurant waiting for my order with a thought about something to look into. I grabbed my Blackberry Pearl, opened Google Docs, and added my thoughts to a notes document I created. Of course, there are many ways you can do this, from the good old notepad, to text messaging yourself or leaving a voicemail to yourself (very guilty of this) or even using mobile blogger to post a message from your phone (as I am doing now). Google Docs has an advantage that you can append an existing document from any device at any time. I'll post more on this later. My sushi is almost ready. Message sent via Blackberry wireless messaging. In my previous articles on detecting mobile browsers, my scripts redirected the viewer to a mobile formatted page, such as the xfruits site I use for 2mlearn.mobi. Greg at Brain Handles offers another suggestion, using the script to reformat a page using mobile detected CSS scripts. There are some challenges to his script, specifically for designers who aren't familiar with php scripting. Personally, I prefer using the simpler script and having a completely customized page for mobile users. This way, you aren't just reformatting the content for mobile, but you can customize the content completely. The php script Greg offers, however, has advantages for internal users who want to reuse content that is simply reformatted instead of offering completely custom content for your viewers. Click here to see Greg's suggested script. 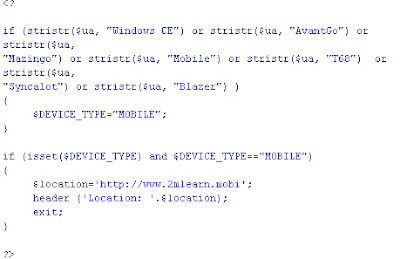 The most visited post at mLearning-World.com is my scripts for how to detect if a visitor is hitting your site with a mobile phone and redirect them to a mobile friendly version of this website (at 2mlearn.mobi). I have received a lot of emails asking how we can modify this script to detect iPhones or Blackberry browsers. For the most part, the script is identical. A Blackberry is a little more challenging as you can have different browsers. For example, I am using Opera Mobile on my Blackberry Pearl. With a Blackberry, the browser detect in the first script should work, however, Opera Mobile reformats the page automatically and thus, the script shouldn't be needed. I am currently experimenting with several other browser options. I'll add a new post as I discover more scripts to help your mobile learners. Has anyone had a chance to use OnPoint Digital Cellcast? OnPoint seems to offer an interesting mLearning tool, allowing users to create audio, video, or assessments sent to mobile devices. This looks like a service our readers would be interested in, however, I would like to hear from anyone who has used this service. Click here for more information on OnPoint's Digital Cellcast. Want to access mLearning-World.com from a mobile phone. Remember, 2mLearn.mobi is a mobile friendly version of mLearning-World. I am still trying to determine specifically what to do with my new .info domains. If you have any suggestions, let me know. In this month's Learning Solutions Magazine, there is a great article on Mainstreaming Mobile Learning. we only now seem to be approaching actual deployment. However, there are still some barriers. In anticipation of the upcoming Guild Research 360° Report on Mobile Learning, an industry expert this week presents a summary of what it will take to bring m-Learning to real life in whatever neighborhood you happen to find yourself. Click here to read this great article. Come back and discuss in the comments section. Also, if you haven't joined yet, the eLearning Guild is, in my opinion, the best Learning Technology industry group you can join. Unlike some other organizations, there is a lot more emphasis on practical application and instruction in the eLearning Guild. Matrix Style Brain Downloads 'Will Make Lessons Pointless'. Children will learn by downloading information directly into their brains within 30 years, the head of Britain's top private schools organisation has predicted. Chris Parry, the new chief executive of the Independent Schools Council, said "Matrix-style" technology would render traditional lessons obsolete. He told the Times Educational Supplement: "It's a very short route from wireless technology to actually getting the electrical connections in your brain to absorb that knowledge." Dr Parry, a former Rear Admiral, spent three years determining the future strategic context for the military in a senior role at the Ministry of Defence. In case you didn't know, mLearning World is on Facebook. The College at Home blog offers us 100 Helpful Web Tools for Every Kind of Learner. I would recommend everyone bookmark this link. I’m on secondment from my Learning Support teacher job this week to a Master Class in using ICTs for Inclusive Education. Always on the lookout to try out new mobile technology, I did of course grab the opportunity for a hands-on with not one but two Asus Eee PC’s (the slightly older 7 inch model). They are of course very small and very desirable! Back to being professional however, it is obvious right from the start that they would be very useful in an education setting, especially given their around A$500 price tag. You’re not getting top of the line specs for that kind of money, but 512mb RAM and 4GB storage would be more than enough for the primary age students I work with. Their size is around that of an exercise book and blends in very well with the items you’d normally find on any kids table. Even the small-ish keyboard is not a problem for younger kids. What else? Its very light, but has a sturdy build-quality, and being able to record audio, pictures and video as well just multiplies the possible educational uses. Plus they are available from just about all chain electronic stores, so support and availability should be good. As you can see from the images at right, one was running Windows XP, with the other one running the Eee PC’s Linux OS, and it was interesting to compare the two. The XP model is the one that my school system would adopt as it will work with our networks, and of course the familiarity for students of this OS is a plus. On the downside though, 7 inches of screen real estate is just a bit too small for prolonged use of XP. The Linix OS on the other hand has been designed for the smaller screen and with its icon and tab-based GUI is very intuituve - students would have no problems navigating its various programs, which include all the productivity and communication software students could need. It even includes some educational games by default. There is a 9-inch screen model coming soon (a few days), as well as similar-sized machines from just about every major PC manufacturer, so this is definitely one class of mobile devices to watch. and Electronic Engineering at Hong Kong University that aims to promote mobile learning as well as to celebrate the Beijing Olympic Games is now open to registration by schools. Primary and secondary school students will be able to test their knowledge of the Olympics and about HKU, while also deepening their understanding of mobile learning through the contest, HKU hopes. Rayson Huang Theatre at HKU. There are individual awards and accolades for schools as well. Reportedly, the initiative will be piloted in two South African schools, and students lucky enough to take advantage will have access to educational games and other material created to meet the needs of the national curriculum according to Engadget Mobile. I have been asked to look into a product called Flypaper. Has anyone tried this out? What are your opinions? How have you implemented this in your training programs? Any and all feedback would be greatly appreciated. It's Vegas Baby! A new paradigm in learning. Quick note: I've been trying out a great new feature that Alltel has, Voice2Text. This service converts voicemail to text messages. I can see a lot of great mLearning opportunities with this. A service like Voice2Text allows the end user to choose how they are presented with the information. If they aren't in a place where they can listen to voicemail, it may be more convenient to simply read a text message. Imagine pairing this with a voicemail distribution system. I'll start working on how this can be used on more specific learning applications. 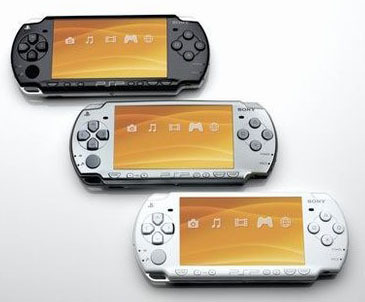 specifically for the Sony PSP Slim & Lite. course), view a sample of Atlantic Link's PSP e-learning at the link below. How do we achieve a balanced solution for mobile content and applications? The iPhone has really raised the bar for mobile web browsing, and most mobile devices will soon have high quality browsing even if the screen remains small. Similarly, the growth area in handhelds are so-called ‘converged’ devices: smartphones or wireless-enabled PDAs. Consequently, I propose it will be a plausible approach to start thinking of web apps as a delivery vehicle for mLearning. Web standards for screen size started at 640 x 480, and have ranged through 800 x 600, to 1024 x 768. The iPhone has established a significant enough market presence to drive a variety of sites to create a version that accommodates the iPhone’s resolution of 480 x 320. Phones can go down to as low as 160 x 160, so that might be your lowest common denominator, but I believe a safe bet could be 320 x 240 which is fairly common on a variety of devices. The new 800 x 600? The point being, that thinking about small web apps may be the cost-effective and logical approach to provide mobile access, content. 160 x 160 is the new 640 x 480, etc. Already there are blogging tools for phones/mobile devices, and wikis are just web pages, etc. Web 1.0 is likely to be a viable solution, and the convergence of Web 2.0 and mobile is a promising place to play. Anyone game? I would like to challenge Clark on one more thought. Maybe no standard size is the new standard? We have years of instructional design methods and standards regarding when to put what content in training. With mLearning, it seems many folks are trying to smash existing content standards into preset screen sizes. Instead of thinking lowest common denominator, why not consider mailable content to the end-user's situation? By this, I mean that content isn't written with one single screen size in mind, but instead, we take the approach of creating content that, by design, will modify itself to the user versus simply the screen size. Think about it this way, if a user is accessing training on a 160x160 handset, he obviously is looking for something, at a time or in a location, that prevents him from accessing this content from a different venue. Does he need a quick answer? If he needs a quick answer or quick training, is a truncated eLearning course the best solution? Over and over, it has been said that one of the factors in mLearning not taking off is screen size. Maybe we as developers are partially to blame as we've been focusing on fitting old eLearning models into new formats? Maybe we need to start changing our models to fit our user's full experience, not just his screen size?